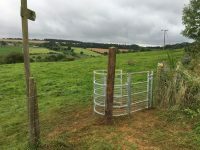 Kissing gates undoubtedly improve access on the Cotswold Way but their constant use often makes them wet and muddy so the CWA has embarked on a trial project to improve the surface around a few kissing gates. 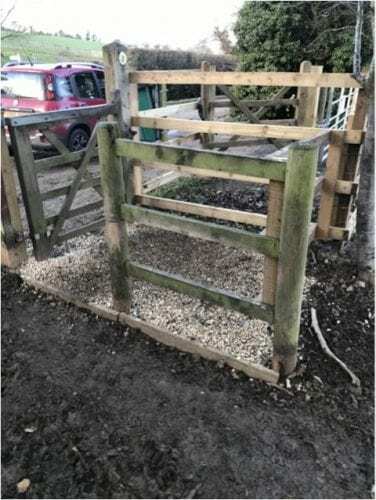 The first project has been completed on a gate where the trail crosses West End Lane, SW of Broadway using eco plastic grid, geo-textile and gravel. The location is point A as shown here. A new bridge on the Diamond Way. The second AGM of the Cotswold Way Association was held on the 10th August at King’s Stanley Village Hall and was attended by 16 members. During the meeting John Tennant and Martin Lovegrove were elected as new trustees and the resignation was received from Margaret Reid. The chairman welcomed the new trustees and thanked Margaret for her services since the CWA was established. The meeting also agreed that the Wysis Way should be added to the list of named trails. 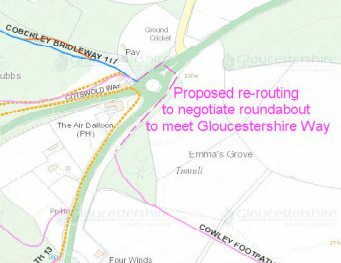 Discussions focussed on new projects and developments on the A417 re-development. Minutes of the meeting will be posted on the website in due course. 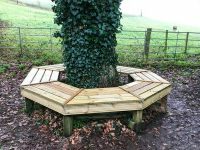 Many walkers on the Cotswold Way will remember the unique octagonal seat around a fine oak tree just outside Dyrham. It was initially built by the Cotswold Wardens to mark the Silver Jubilee in 1977 but has recently been showing it’s age. 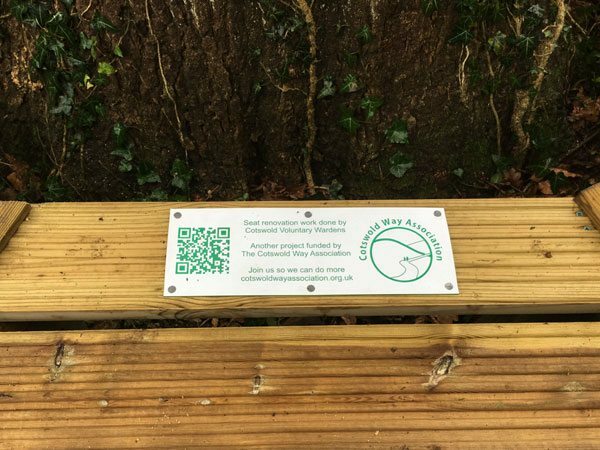 The CWA has stepped in to provide funding for a renovation of the seat so that it can once again be a welcome resting place for passing walkers. The work was carried out by Cotswold Voluntary Wardens – Avon Valley District. 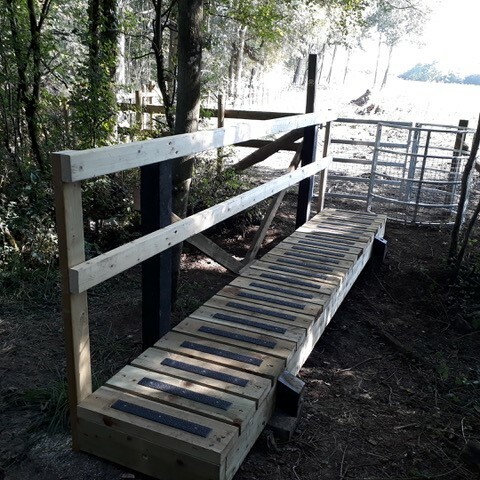 Following a request for funding, the CWA have contributed towards some welcomed improvements to access on a section of the Gloucestershire Way and Winchcombe Way at Little Farmcote. After climbing the escarpment out of Winchcombe and legs a little tired, a narrow stile on the path overlooking the Farmcote valley has been replaced with a kissing gate. Further along the trail a quirky set of sheep hurdles tied with baler twine has been replaced with a combination field gate, a gate within a gate to speed walkers on their way. The 2017 Annual General Meeting was held at King Stanley Village Hall on the 4th August 2017 and many topics were raised about the general direction of the charity. 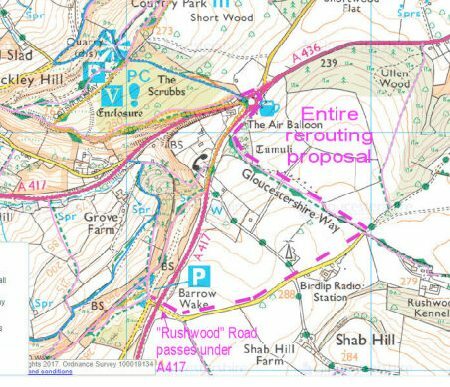 The Chairman proposed that the main activity over the next twelve months would be to publicise the CWA and to engender increased support from users of the Cotswold Way and the many organisations that benefit from its use. 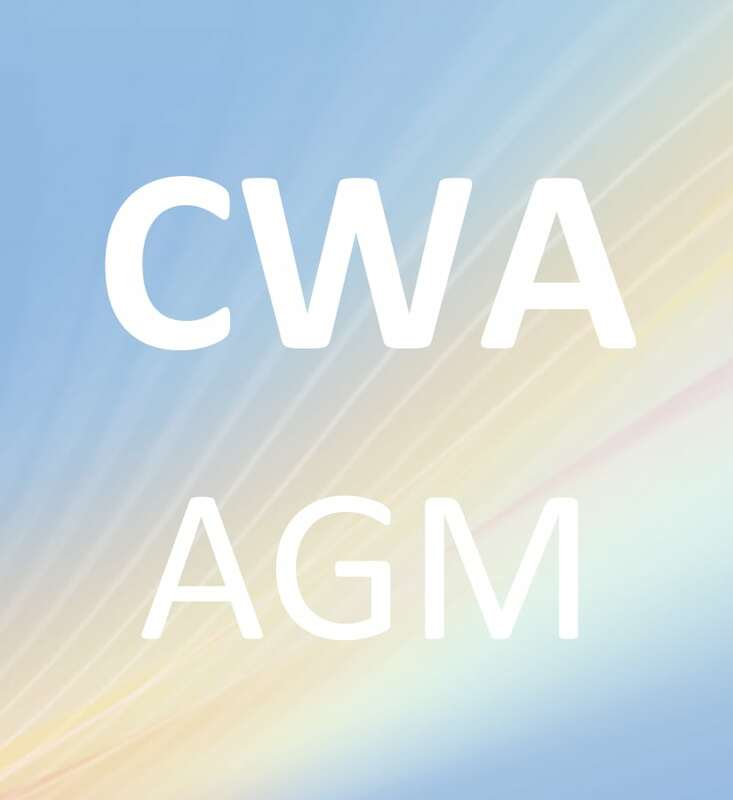 In closing the meeting the Chairman thanked his fellow trustees for their work and support in establishing the CWA over the past year. 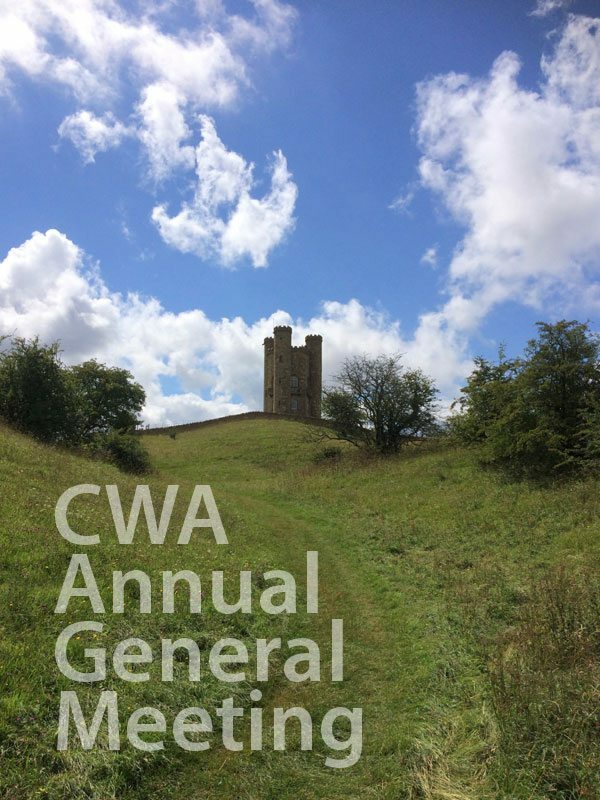 CWA publishes its first Cotswold Way Association newsletter. 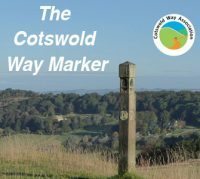 CWA has published the first Cotswold Way Association newsletter. We thought it about time we gave you, our members and supporters, an idea of what we’ve been up to and what’s planned for the future. The Cotswold Way Association has been established as a registered charity for nearly a year. It’s taken longer than expected to put the pieces together, but the organisation is now fully operational. 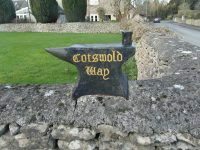 At its heart is our interactive website, www.cotswoldwayassociation.org.uk. Special thanks for getting it off the ground are due to Rob Talbot from Winchcombe Welcomes Walkers and Ronald Gijsel of Webees. Thanks also to the Ramblers Holidays Charitable Trust who generously met the design and start-up costs. Recently I completed the southbound walk with around twenty other walkers that made up the 2016-17 group. 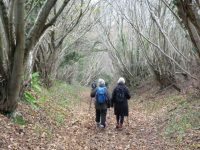 Although as a Cotswold Voluntary Warden I was familiar with the southern section of the route I was keen to complete the whole of the Cotswold Way and explore, with our knowledgeable wardens, unfamiliar sections of the Cotswold Way. Set out below in the link are some of my memories from our journey south from Chipping Campden.